Yesterday 30,000 people sang the " Happy birthday to you" song to Sachin Tendulkar as he cut the cake in Mumbai during the IPL match between MI and RPS. It was heartening to see the effect the little master still has with the crowd. I have followed him through out his career. When I started following cricket as a 5 year old boy (1987), Krish Srikanth was my favorite batsman. I loved cricketers who smashed every ball and at that point of time, India had only one swashbuckling opener and his name was Srikanth. Navjot Singh Sidhu was also good with his six hitting abilities; but when Srikanth was facing the ball, you can always expect him to throw his bat at everything and that was a joyous sight to see. I used to like Tendulkar because he scored quick. He was young, came in at 5th or 6th scored some brisk 30 or 40 runs. 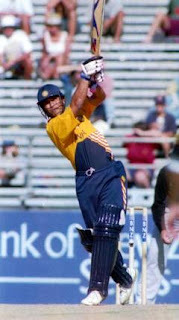 He would often come in to bat in the 45th or 46th over. March 27th 1994- the date is still fresh in my memory. I was writing my 7th standard annual exams. India was touring New Zealand. It was the second ODI. India pinned its hopes on Navjot Singh Sidhu the opener. But on that fateful ( or should I say joyous) day, Sidhu woke up with a stiff neck and he could not turn his neck. Young Sachin ran up to his captain Azhar and pleaded with him to let him open the innings. Azhar and Ajit Wadekar were surprised with a young batsman running up to them with such an offer. New Zealand had a deadly bowling attack spearheaded by Danny Morrison. Chris Pringle was unplayable in those conditions and Larsen was pinpoint accurate. And taking the responsibility to open the batting against such an attack was an act of bravery. New Zealand batted first and scored a paltry 142 in their allotted 50 overs. A score of 142 in New Zealand was still defend-able because matches in New Zealand were low scoring affairs. 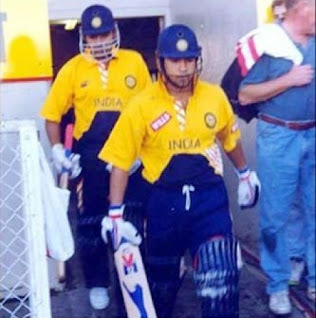 Sachin and Jadeja opened the batting for India. I was watching the match on ESPN and was surprised to see Sachin walking into bat. Morrison and Pringle were taken to the cleaners. Sachin redefined the art of opening. Indians were scoring at ten runs per over. He faced 48 balls and smashed 82 runs from it. Gavin Larsen was a stump to stump bowler and Sachin clearly unsettled him by coming down the wicket and taking him to the stands. A star was born on that day. India chased down the total in 23 overs at a run rate of 6 per over. The world media turned their focus on this guy from India. The little master finally made the world to notice him and from then on, there was no turning back. He no longer had to come into bat in the 45th over. He would open the bating and score a brisk 50 and take the team score to 100 odd runs in the first 15 overs itself. After he gets out, the whole team would crumble down. But more often that momentum he gives would be more than enough to help the team cross the shore. He went on to score 100 centuries in his career. The desert storm century, world cup 90 against Pakistan in 2003, first man to score 200 happened in his career. But in my opinion, it all started in that match in Auckland in 1994.